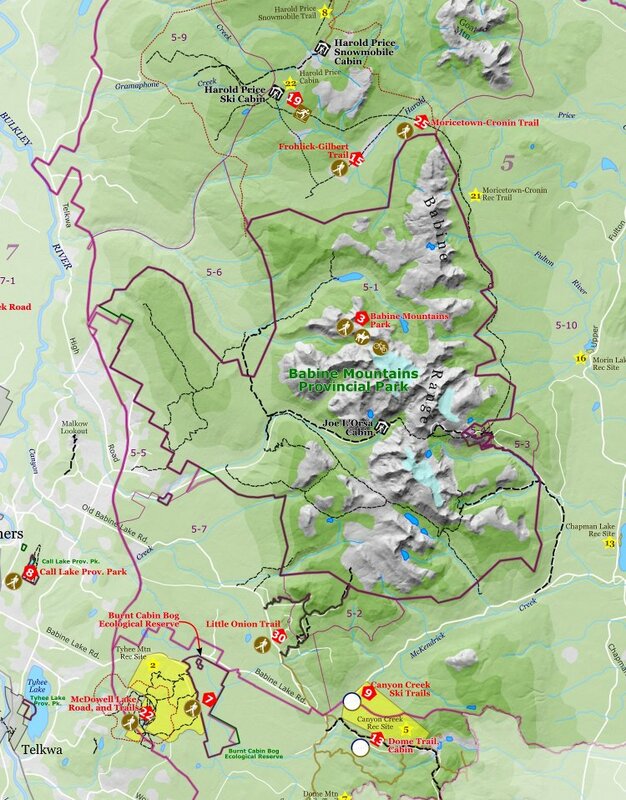 The Bulkley Valley Community Resources Board periodically convenes meetings to discuss local agreements over which areas of the backcountry permit motorized access. The goal is a Recreation Access Management Plan or RAMP. These maps were made to familiarize RAMP table members with all the areas under discussion. I constructed the base map from four semi-transparent polygons representing land below, respectively, 500 m, 750 m, 1000 m and 1250 m. I created these from contours that were in turn generated from the DEMs for NTS maps 093L (Smithers) and 093M (Hazelton). The shaded relief basemap (available by WMS from GeoBC at this URL) pokes through above 1500 m.
The effect I was going for was that water, roads, vegetation and shaded relief in the valley bottom, which is mostly private land, are largely obscured; while the mountain areas, mostly Crown Land and therefore the topic of the discussions, stand out. Roads, vegetation and water are from NTDB. Parks, ecological reserves and rec sites are from the Land and Resource Data Warehouse. 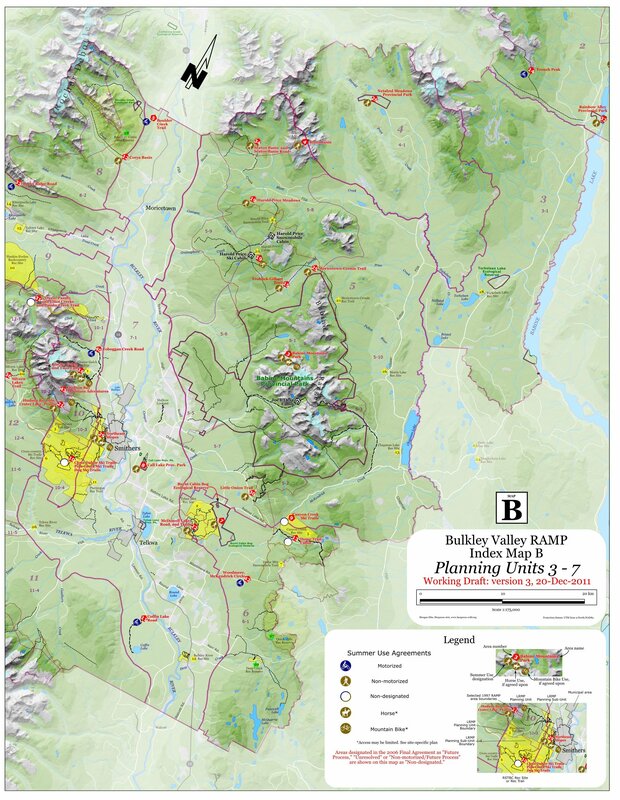 All of this serves as the background for information about the RAMP areas under discussion, as well as the LRMP (Land and Resource Management Plan) framework, which appears as purple lines and numbers. There were three map sections (A, B & C), each of which was a different print composer in the same QGIS project. This panel is rotated 30° to get the best scale for the area. Labels and explanatory notes were added in Inkscape.